Run time: 2 hours and 18 minutes including intermission. 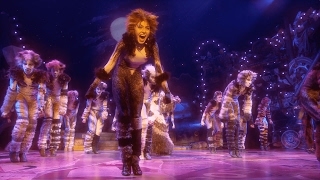 Rediscover Cats —the beloved Andrew Lloyd Webber musical with breathtaking music, including one of the most treasured songs in musical theater, “Memory.” Winner of seven Tony Awards® including Best Musical. Featuring new sound design, direction and choreography for a new generation — experience Cats for the first time as it begins a new life, or let it thrill you all over again! SHOW CONTENT: Based on a collection of poems by T. S. Eliot, this long-running show about a gathering of cats explores each of their unique lives and personalities. Children will be drawn in by the feline make-up and costuming, energetic dance choreography, and music. Some young children may not have the attention span for this full-length production. Children under four (including babes in arms) will not be admitted.